Explore the Data Behind Blood-Free Media with this Free Poster. The use of serum-derived components in the expansion of mesenchymal stem cells has always presented issues with variable performance, the presence of questionable stabilizing reagents, and the potential adventitious agent contamination. InVitria's blood-free Cellastim S and Optiferrin solve these problems, ensuring the highest degree of chemical definition while still providing equal performance to native human serum albumin in the expansion of Mesenchymal Stem Cells. 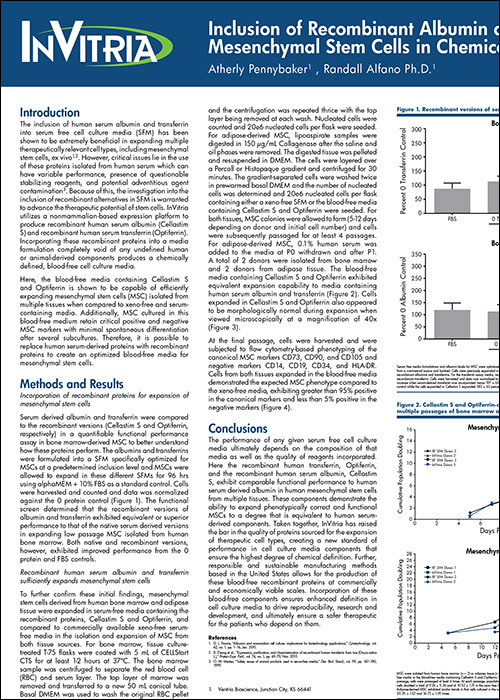 Decreased variability in cell culture media. Reduced cost in time and resources for manufacturing. Want to see the data for yourself? Download this free study performed by InVitria.